The cabinet's decision to include Rachel's Tomb and the Cave of the Patriarchs in the list of national heritage sites may ignite a war, Palestinian leaders say. Palestinian President Mahmoud Abbas said Tuesday that the Israeli decision about the two sites, located in Hebron and Bethlehem, was "a serious provocation which may lead to a religious war." Speaking at the Belgian Parliament in Brussels, Abbas said that the move taken by Prime Minister Benjamin Netanyahu followed a request made by US President Barack Obama for trust-building moves towards the Palestinians. "We have reached a very critical stage, which requires coordinated and intensive international activity, as we must stop the building in the settlements, which are killing the peace process and contradict Israel's commitments, which stem from the first clause of the Road Map and from the signed agreements," the Palestinian leader said. Abbas said that the political freeze was not the result of the Palestinians' refusal to accept what has already been agreed on. "Israel asks to resume the negotiations on the backdrop of the ongoing settlement construction, claiming that everything can be put on the negotiating table, but this is happening while facts are being created on the ground. "We expect the European Union to play an active role, which will complement the American role. Any delay will lead to a termination of the peace options and will send the region into a new swirl of violence." 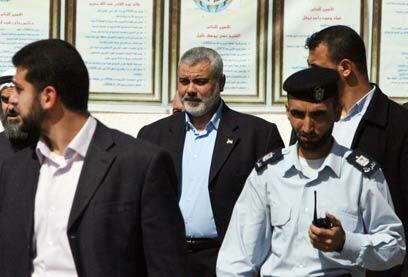 The Hamas prime minister in Gaza, Ismail Haniyeh, presented an even firmer stand. He called on the Palestinians to launch a new intifada in protest of the decision to add the two places to the heritage sites list. Haniyeh said the Israeli move was a show of complete disrespect towards the Palestinian negotiations team. "This move disrespects anyone seeking to keep the framework of the diplomatic settlement. Israel is implementing a plan spreading from Jerusalem to Hebron and Gaza, from Jaffa to Lod and Ramla, and all this on the backdrop of vague negotiations." The Hamas prime minister said that all of Israel's moves are annulled and do not obligate the Palestinians. "Jerusalem is ours, the land is ours, and God is with us. We will not accept these decisions and they will have no ramifications." The Palestinian Authority continues to condemn the plan, and claims it proves Israel does not want peace. The PLO has expressed support for the Palestinians' battle in Hebron. The Palestinian protest reached the ground as well. Dozens of Palestinian teens threw stones at Israel Defense Forces soldiers and torched tires in Hebron's city center and the Old City, which are areas under Israeli control. The forces responded with means for riot dispersal, and no injuries have been reported. In addition, a general strike took place in Bethlehem because of the inclusion of Rachel's Tomb in the heritage plan. All of the Palestinian Authority's organizations, schools, and private firms went on strike in protest against the decision, and eyewitnesses describe growing IDF presence in the area of the holy site. Stone throwing was also reported. On Sunday the government approved a comprehensive plan to preserve heritage sites across the country. Following pressure from a number of ministers, Prime Minister Benjamin Netanyahu added two sites to the plan: Rachel's Tomb in Bethlehem and the Cave of the Patriarchs in Hebron. See all talkbacks "Abbas, Haniyeh: Heritage sites will ignite a war"